The world has ended, but our heroes are still very gay, very alive, and still fighting. If I could sum up Heather Flowers’ latest visual novel slash arena brawler in one sentence, it would basically be that one. EXTREME MEATPUNKS FOREVER is the latest release from Heather, and it’s a short, funny, and touching look at a post-apocalyptic future populated primarily by mech pilots. This release is part one of a continuing series, but with five short episodes in its single executable, it’s very much a complete story in its own right. Mechs in MEATPUNKS are, as you might guess from the title, made of meat. Flesh, either harvested or vat-grown (as explained by one of your squadmates, Brad) is woven into intricate, larger-than-human homunculi of fighting power. It’s a disgusting, off-putting, and eerily alluring reconceptualization of mechs, that takes the idea of a mech suit being a second body and makes it literal. And bloody. As a game, MEATPUNKS is about half-and-half a conventional visual novel (complete with simple, ANSI/ASCII background art and lovingly rendered character sprites) and an arena brawler, with each of your squad’s mechs performing slightly differently on the playfield. It also gives the player the option to skip most of these fights (if you’d rather just have the pure VN experience), although as a break from reading, the scenes are pretty well done, and romping around doing ring-out competitions is executed fairly well. The game’s art style is crude. That’s not a bad thing, it feels like the same abstraction of complex concepts (in this case, hulking fleshy mechs) into simple graphics as early pixel games on the Atari 2600 or NES did. The art isn’t, in a strict sense, meant to ‘look’ like what it’s depicting, but to invoke it, a theme that resonates throughout the game. The world of MEATPUNKS may be post-apocalyptic, but it’s not terribly unfamiliar. The core group of characters each have their own histories relating to contemporary social marginalization, be they trans, queer, disabled, not white, neuroatypical, or some combination therein. The primary enemy faction in the game are bigoted fascists with support of the remaining police force, a dynamic that rings very true in the wake of modern police battalions standing off against antifascists in American streets. 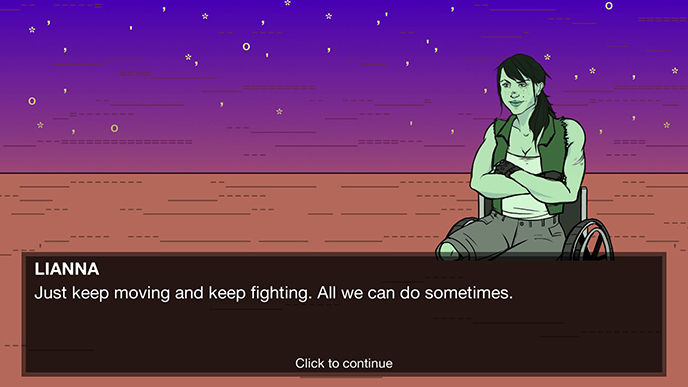 MEATPUNKS makes no effort to hide its political leanings, and the game shines because of it. This is an explicitly anti-fascist game, with all the trappings of being one. It’s a short experience—about three hours or so depending on which side-routes you pursue—but even in that time the writing shows its muscle. These characters feel like real people, struggling with real issues in an otherworldly setting. You learn from these characters, and grow with them, even in the short time allotted to you. That’s what’s so alluring about MEATPUNKS. Through strength of writing and attention to detail, this weird world really feels like it works. Sam, the former farmboy, struggles with his closeted sexuality. 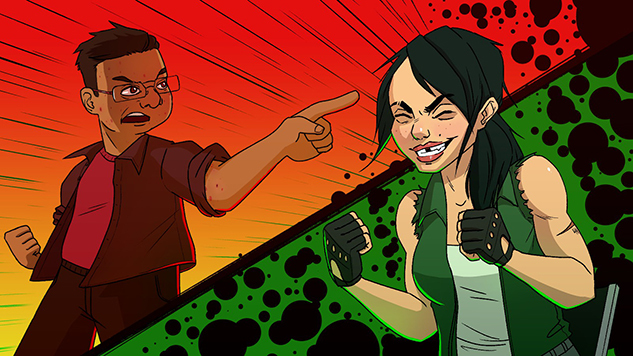 Brad, the talkative mechanic, constantly butts heads with ex-professional mech fighter Lianna. Cass, the erstwhile leader of the small group, knows that whatever choices they make could lead to the few people they love meeting a fiery end. It’s a game that is defined as much by its rough edges as by its moments of brilliance, the kind of game you want to show people as an example of what small games and small game makers can do for the medium. It’s dark, and angry, but also hopeful—hopeful that even in the darkest times, the thing that keeps us going is the people we love, and the fragile bonds of trust we can forge in a world out to destroy us.